Updated Sunday June 4, 2017 by Manager NCTRSL. It is the goal of the Northwest Connecticut Recreational Soccer League (Barkhamsted, Colebrook, Hartland, Norfolk, Winsted) to provide a safe, fun, and enjoyable environment for our children to learn and play soccer. It will be the primary objective of every Coach, Referee, and Parent to ensure that this goal is achieved and maintained across all towns in our league. All coaches, parents, and players shall read and agree to this Code of Conduct, acknowledging that he/she understands and agrees to comply with this contract. By virtue of registering and being given this document, either via the website or paper registration, all players, coaches, and parents shall be held accountable for their actions. It is the responsibility of every member of this league to ensure that every participant understands and complies with the guidelines set forth. Speak disrespectfully to any player, coach, spectator, referee, or representative of the league. At any time, be guilty of a physical attack, lay a hand upon, push, shove, strike, or threaten to strike another. Be guilty of the use of profane, obscene or vulgar language in any manner at any time or be guilty of heaping personal, religious, sexual, bigoted, or defamatory comments upon any individual for any real or imaginary belief, decision, or judgment. Be guilty of an objectionable demonstration of dissent at a referee’s decision in any unsportsmanlike action. Appear on the field of play, stands, or anywhere on the soccer groups or complex while in an intoxicated state. Intoxicated will be defined as an odor or behavior issue. Smoking while in the stands or on the playing field. Smoking will only be permitted in designated areas, which will be out of view from any spectator stands or benches. Be guilty of tampering or manipulation of any league rosters, schedules, team selections, official scores, team rankings, financial records or league rules and procedures. Challenge a referee’s authority. The referee shall have the authority and discretion during a game to request the offender be removed from the game and the soccer field area. Challenge a referee’s judgment call in any manner including in a verbal or physical manner. Any inappropriate behavior by a spectator may be cause for the suspension of the game by the Referee. The Referee will engage the respective team head coaches to have the spectator removed. Game suspension may continue until such time as the spectator leaves the soccer field or complex area and deemed satisfactory to the referee. Northwest Connecticut Recreational Soccer League representatives, one representative from each town and the head referee, will review all infractions of the Code of Conduct. Depending on the seriousness or frequency, the league may assess additional disciplinary action up to and including expulsion from the league. Play for the fun and enjoyment of the game. Work hard to improve my soccer skills. Be a team player, get along with and cooperate with my coaches and teammates. Always be a good sport. Respect my coaches, teammates, parents, opponents, and referees. Not argue with the referee. Not use any profanity at practices or during games. Not, under any circumstances, participate in physical violence or threats of physical violence before, during or after any game or practice. I will obey the laws of the game and play within the spirit of the laws. 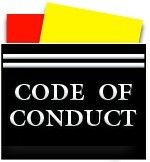 Supporting and assisting my child in adhering to the overall and players Code of Conduct. Not using or possessing alcohol, illegal drugs or weapons while attending any practices or matches. Not, under any circumstance, shout abusively at my child or any other child. Not, under any circumstance, shout abusively or threaten any physical abuse to any coach or referee. Not dispute any call made by the referee; and I understand that the League may sanction any spectator who verbally abuses or assaults a referee. Not coach my child, or other children, from the sideline during the game. Will only make positive comments to the players and understand that coaches, not parents, shall provide instructional input during games. Understanding that the game is for the children, not for the adults. Understanding that obscenities are strictly prohibited and that the referee shall instruct any spectator guilty of using obscenity to leave the venue. Understanding that Northwest Connecticut Recreational Soccer League parents are responsible for the behavior of all of their team’s guests/spectators and that they shall act in accordance with the Code of Conduct.